The only add is working with pages that are charging in asyncronous manner(without reloading of browser). 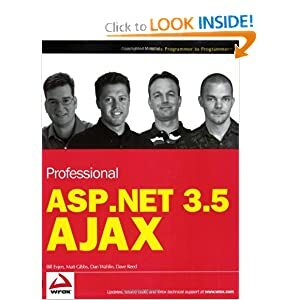 So what happened, since many developers had no time to spent tyo learn as mastering Ajax many other libraries were born ASP.NET /AJAX was one of these. It simplify in great manner developer job without the need to act from scratch as in the first years of its diffusione. Originally an external extension of ASP.NET from 2.0 version (2005 and after) it is now part of ASP.NET with ASP.NET/AJAX control toolkit as useful tool that integrate with this. So I want report two of the best(if not the best in absolute) books on all over the world on this technology). it introduce this techlogy in fast and concise manner, with many simple examples of the core libraries. The strong feature of this book is that it is economical too. Chapter 1: Overview of AJAX. 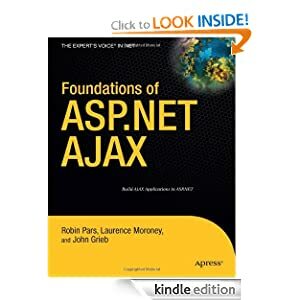 Chapter 2: ASP.NET 3.5 and AJAX. Chapter 4: Understanding the ASP.NET AJAX Client Library. Chapter 6: Controlling the Back Button. Chapter 7: The ASP.NET AJAX Toolkit. Chapter 9: ASP.NET AJAX Networking. Chapter 10: Working with Animations. Chapter 11: Building Custom Controls. Chapter 15: Testing and Debugging ASP.NET AJAX Applications. Chapter 16: Deploying ASP.NET AJAX Applications. choose between the 2 books is only a problem of skill you have, alternately you can choose to learn it with practice even if it is really hard for novices.